This recipe was submitted by Gena Olivier Peterson. Gena is a private chef from Los Angeles California, now based in Austin Texas and she runs The Kitchen Window. Her clients have ranged in dietary needs and preferences from Raw, Paleo, and Vegan to healthy gourmet. Gena incorporates her passion for clean and densely nutritious foods with her love of all ethnic cuisines, in every meal she makes. It is such an honor to have her submitting recipes here at Simple Recipe Box! 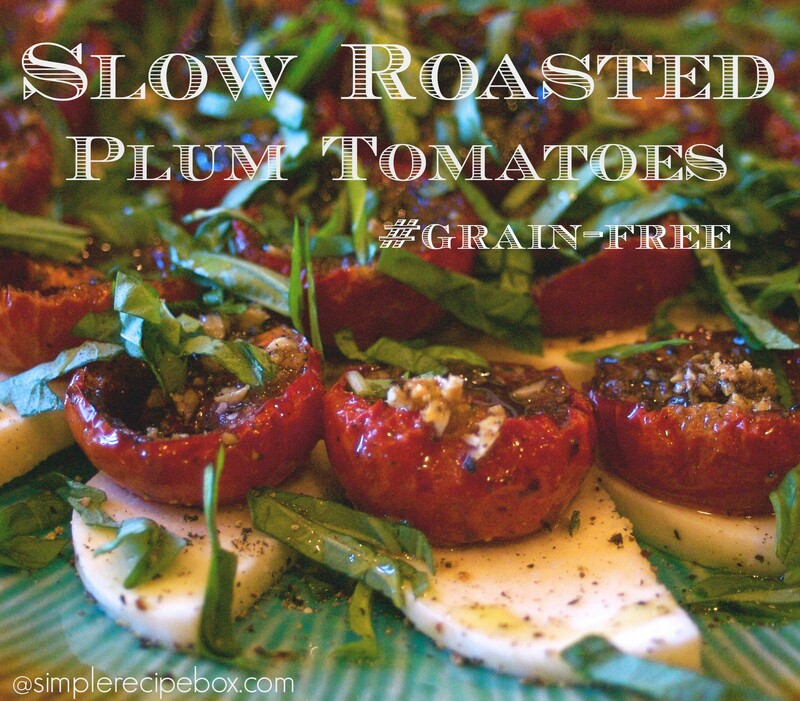 This simple slow roasted plum tomatoes recipe would make a great appetizer or a light meal and will surprise you with it’s flavors. Lay tomatoes on a parchment paper-lined sheet pan, cut sides up, in a single layer. Drizzle with oil and the balsamic vinegar. Sprinkle with the garlic, sugar, 1 1/2 teaspoons sea salt, and 1/2 teaspoon pepper. Roast for 2 hours until the tomatoes are concentrated and begin to caramelize. Allow the tomatoes to cool to room temperature, then serve and enjoy. These turn out so beautiful but they are very simple to throw together.